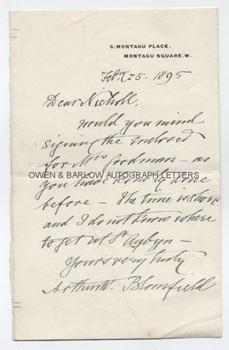 SIR ARTHUR BLOMFIELD AUTOGRAPH Letter Signed. ALS. 1p. 6 Montagu Place, Montagu Square, W. February 25th 1895. To Nicholl. "Would you mind signing the enclosed for Mr Goodman as you have kindly done before. The time is short and I do not know where to get at St. Aubyn." 8vo. 8 x 5 inches. Lacking integral blank leaf. Very good. Sir Arthur Blomfield is noted for a large number of buildings, both in the UK and overseas, but he is probably best known for the Royal College of Music and for his buildings for the Bank of England, most notably the Law Courts Branch in the Strand. He was also the architect of St. George's Anglican Cathedral in Guyana which, until 2003, was the tallest wooden church in the world. The novelist Thomas Hardy joined Blomfield's practice as an assistant architect in 1862 and the two remained lifelong friends. Sir ArthurBlomfield was president of the Architectural Association and vice-president of the Royal Institute of British Architects. Nicholl is probably the architect S.J. Nicholl and St Aubyn is probably the architect J. P. St Aubyn who was surveyor to the Middle Temple and who died in May 1895.